A promotion article of the new MEng in Smart Grid at CPUT has been published in the latest issue of the the wattnow magazine (February 2019). This entry was posted in Articles, Courses, DAMOC, Dissemination, News on 04/03/2019 by Webmaster. 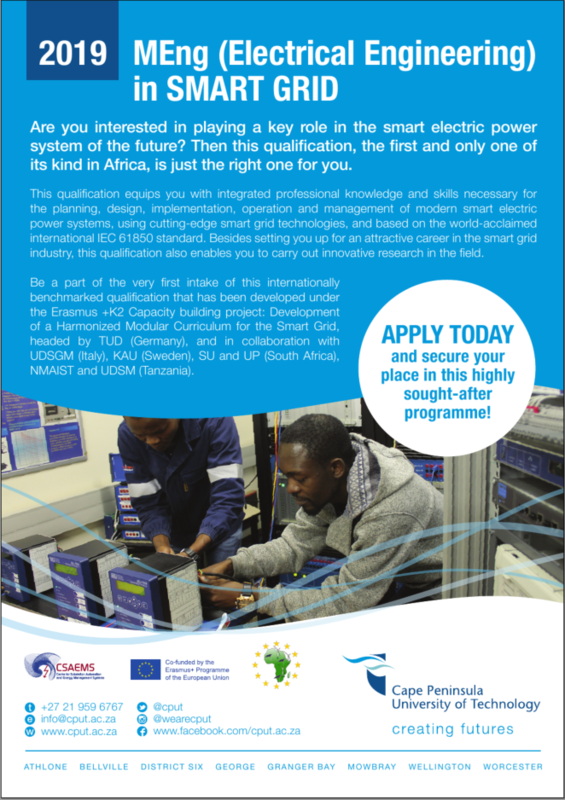 A flyer to promote the new MEng in Smart Grid at CPUT was designed and distributed before the start of the program. Soon the course will start we will keep you posted. This entry was posted in Courses, DAMOC, Dissemination, News on 12/02/2019 by Webmaster. Our second video about the DAMOC project is available. It is a recording of a sample lecture as example for distance learning materials recorded during our project meeting at USGM. This entry was posted in Courses, DAMOC on 28/03/2018 by Webmaster. Our first video about the DAMOC project is available. It is a recording of a sample lecture as example for distance learning materials recorded during our project meeting at USGM. This entry was posted in Courses, DAMOC on 14/03/2018 by Webmaster. This entry was posted in Courses, DAMOC on 12/03/2018 by Webmaster.